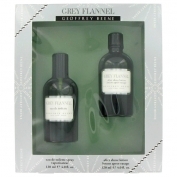 Grey Flannel by Geoffrey Beene is a Oriental Woody fragrance for men. Grey Flannel was launched in 1975. The nose behind this fragrance is Andre Fromentin. Top notes are galbanum, neroli, petitgrain, bergamot and lemon; middle notes are mimosa, iris, violet, sage, rose, geranium and narcissus; base notes are tonka bean, almond, oakmoss, vetiver and cedar.